Last month, I had an opportunity to lead several mental skills clinics at the Jameer Nelson Foundation's Basketball Academy at Neumann University. In speaking to these basketball players from middle school and high school, most of the players were very focused on and concerned about how many points they could score in a game, and how they could simply outplay their opponent on the court. What I began to realize, and wanted to share with them, is that they didn't understand how important the mental game was to their overall development and success as a basketball player. Just like a stable building which needs a strong foundation to remain standing, the foundation of a successful basketball program is based upon the mental fortitude of its players. The fundamental strength of that program is the collective mindset of the players, and how they use specific mental skills on the court. So, if you want a solid foundation for your basketball program, then you need to structure your training and practices around the mental conditioning of your players so that they are mentally prepared to play their best game. 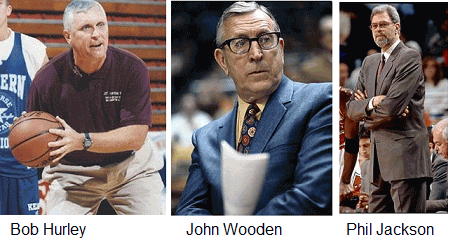 Whether it was Phil Jackson with the Chicago Bulls, Bob Hurley and the St. Anthony High School basketball team or John Wooden at UCLA, the most successful coaches have understood the importance of the mental game to basketball. From Hurley encouraging his players to find their purpose in practice to Wooden's "pyramid of success" and Jackson's use of meditation, these coaches always looked for opportunities to show their players how to manage their thinking and emotions in order to elevate their performance. They knew that the foundation of their team's successes depended upon the players' mental tenacity and resilience. As a basketball coach, you want to give your players the necessary mental skills to not only sustain themselves but to remain emotionally strong as they face various challenges and difficulties in the game. You will be teaching them what to think and how to think so that they can effectively process, in their heads, every game-time situation and play up to their potential. It's providing them with the tools to be disciplined, driven and decisive. Laying that foundation for all of your players is showing them how to create a compelling story about their life as a basketball player, set goals for the season and identify the steps to reach those goals, build a strong belief system, and serve the greater good - their team. After completing those mental skills clinics for the basketball players at Neumann University, I thought about those athletes who set themselves up for failure because they don't have a strong mental foundation on which to build their game. I started drafting an overview for a mental conditioning program entitled "Set For Success: Setting Yourself Up For Success In Sports". The purpose of this program is to give basketball players a framework by which they can learn how to focus on what they control, to know what they want to accomplish and achieve, to visualize and mentally rehearse how they want to perform, to maintain their composure on the court, and to appropriately respond to any challenges. This framework for helping players with their mental preparation is essential to laying a strong foundation for your basketball program. So, ask yourself - What am I doing to lay the foundation for my basketball program? How am I helping my players to be mentally prepared to perform at a higher level and play their best game?